ČZ Strojírna is a prestigious producer of highly precise internal and cylindrical grinding machines , special grinding machines for parts of injection pumps of vehicle engines, single purpose machinig equipment and transfer lines for automotive industry, endworking machines and a variety of special machines built customer-like. The tradition of production is more than 50 years long; sales territories are Europe, the USA and Russia. New machines and advanced technical solutions rise in in-house designing team that represents a creative potential for realization of each cutomer´s wish. Resultant machine accuracy generates already during production of basic elements. 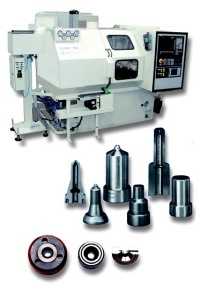 The demand for top quality penetrates into the whole production process and machine building. ČZ Strojírna utilizes its flexibility and creativity and realizes non-standard technical solutions. It reacts to the general trend in the market of machining equipment - which is transforming of older hydraulic-mechanic machining equipment into CNC type – of both its own machines and machines of other producers. New machining equipment of ČZ Strojírna is able to meet the most challenging demands in automated operations of a wide industry range. Perfect quality and keeping of the agreed terms together with fair prices are – in the environement of strong competitivness – the main argument for customers´ decision for products of ČZ Strojírna.